I don’t want to keep things from you, friend. I don’t want you to think that reducing your waste is some pie-in-the-sky ridiculous thing that only people with tons of time on their hands would ever attempt. Anyone – that means you – is capable of cutting down on the trash you produce in your home, office or out there in the world where you live. I don’t say this to add guilt and make you feel like “Oh @%# I should be doing more!” … No one needs that kind of guilt in their life, sheesh. I just want to share a little secret: there are easy things anyone can do. I promise! Even if it seems too insurmountably hard (or silly, or whatever) to attempt to reduce your landfill waste, I hope you’ll keep reading. Below I share what I think one of the “secrets” is to actually reducing the pile of garbage you have to lug out of your house every few days or week. Maybe you don’t think you can make a difference for the environment, but you will definitely make a difference in your own environment by adopting some trash-reducing practices. 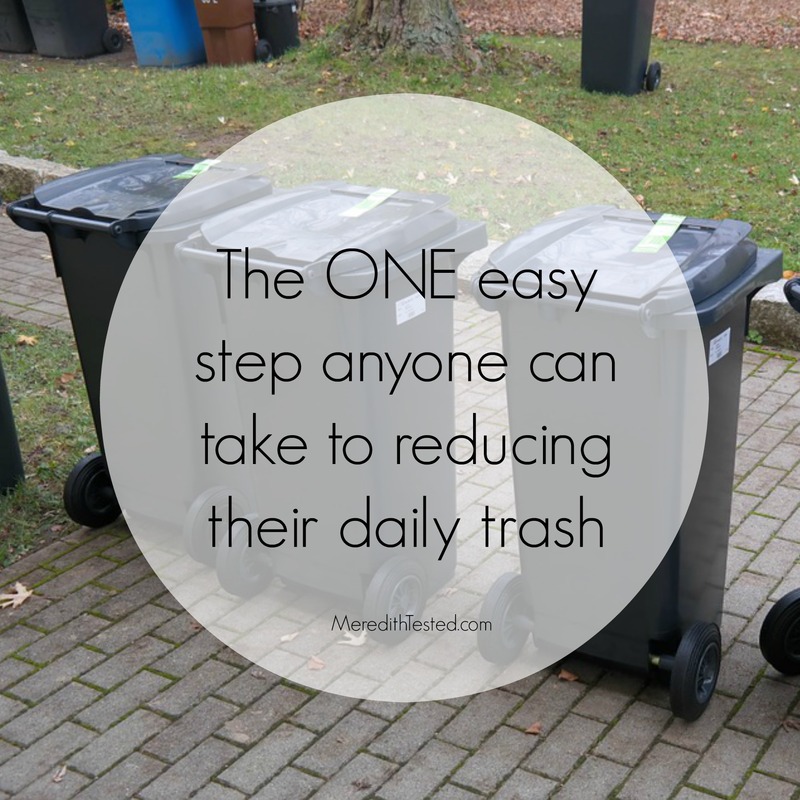 Even if you’re just not having to take the trash out as often, that’s a huge win in my book! Sure, “Bring your own mug!” might be the battle cry of the zero waste movement … but you might already be doing it. Or maybe you don’t even drink coffee or ever buy it at a coffee shop. But you still might be producing unnecessary trash. The point is, you are the only one who knows what you or your family need to do to reduce your household and personal trash. So maybe you already bring a reusable coffee mug (and water bottle, and shopping tote) everywhere you go … but what are you throwing away? Here’s the secret >>> take a peek inside your trash bin at home or at work. Check out the little pieces of trash that collect in your car or backpack. Or the pockets of your coat. What have you found? Food wrapping? Shampoo containers? Plastic bags? Paper towels? Food waste like banana peels and the food you scraped off your dinner plate last night? Receipts? Chip bags? Okay, great! Now pick ONE THING in your trash bin. You don’t actually have to pick it up if you don’t want to but it helps to hold it in your hand. Where did it come from – Was it a gift or freebie? Did you buy it? Is it truly landfill waste or can it be recycled or composted? If you answered YES to this question, dispose of the item in the recycling or compost and go back to your bin to choose something else, and start again at #1. Can I reduce my need or want for this item somehow? For example, if it’s a cough drop wrapper, maybe you decide not to buy another bag, ‘ration’ the ones you still have and drink tea with honey and lemon when possible instead of choosing something with a disposable wrapper. Can I buy or make a lower-waste or zero waste version of this item? That last question might seem hard, but maybe it’s not. There are lots of resources out there for people trying to reduce their personal trash. Just Google “zero waste + [your item]” and see what pops up. Or, leave me a comment or email (meredithtested@gmail.com) and I’d be happy to help you out! Let’s say the thing you’re holding is the broken cap off of your face cream. Can you try to find a moisturizer that comes in easily-recyclable glass with a metal lid? Can you make your own or switch to an oil that you can purchase in a larger container that’s a “less waste” option because of the packaging-to-product ratio? If it’s a cheese wrapper, see if you can purchase that same or similar product from the deli counter. At many stores you can just hand over your container and the deli staff will put the sliced cheese in for you, with the sticker label on top. Maybe its shipping packaging. If it’s in good condition, perhaps save it for future use or in the case of bubble wrap or packing peanuts, see if you can bring it to a local shipping shop for them to reuse. It’s not a perfect solution, but it gives the item a bit more life before it’s inevitable trip to the landfill. If its something that broke or was damaged, replace that item with something that in the future could be recycled, reused or composted. For example, if you have a broken plastic spatula, replace it with a wooden one that could be composted or recycled at the end of its life. Take small steps. Take more small steps. Continue going through your whole trash bin if you want, or just stop at one item for now. Reducing trash takes time but knowing what you personally are dealing with in terms of our garbage output is half the battle.